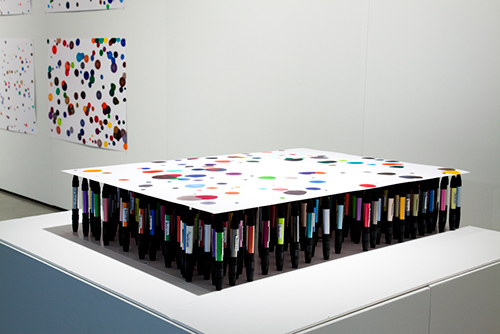 A complete set of Pantone marker pens standing on their base with their nibs facing upright. Single sheets of A1 paper carefully placed to rest on the bed of pen nibs. Each left for twice the duration of the previous print, giving the gradually drying pens more time to mark the paper. For each print the pens where rearranged in a random composition.